It looked like a good evening for sunset photos. 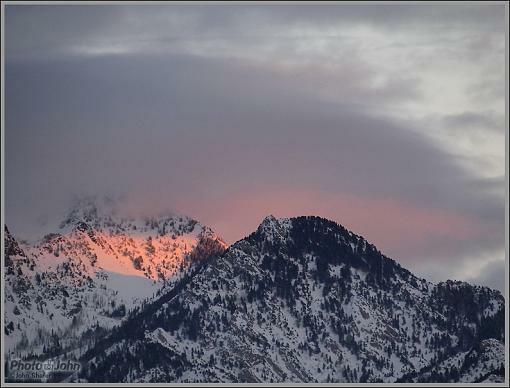 Usually I shoot east for the alpenglow on the Wasatch Mountains. I was doing that this evening (first photo) and it was a little spotty but good. Buy was I surpised when I turned around to walk home. The western sky was ON FIRE! These were both taken with the new Olympus E-PL2 and the new 40-150mm ED MSC zoom lens - a nice combo for handheld sunset photos. The first one with the little patch of alpenglow was taken at ISO 400 and the second "sky on fire" photo was taken at ISO 800. Both were shot handheld and both were processed with Lightroom and Photoshop. WOW, that second one is off the hook! love the powerlines in it too - how often do you find yourself saying that? Beautiful images - both of them! Just wanted to comment that I usually avoid power lines at all costs when shooting. HOWEVER, your comment made me take a longer look. I can't believe that I'm converted! I actually agree with you - the powerlines add something to this image. I live across the street from a church - and the beautiful church steeple is right outside my window, but I can never get a shot without powerlines in the frame. I've never really tried to incorporate them - so I've missed some beautiful rainbow shots in beautiful skies many times. I'll have to try to get the composition right - where they won't look like they've ruined the shot. 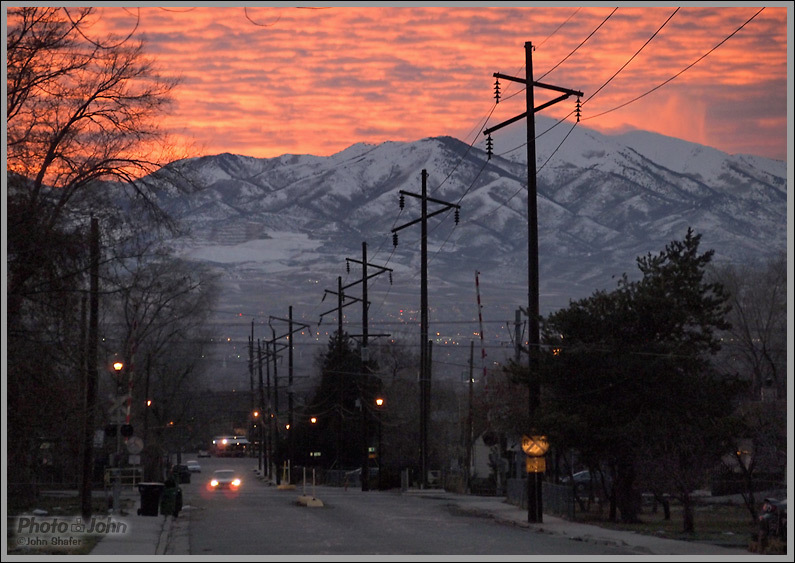 I'm always looking for places to shoot the mountains without powerlines in the way. However, sometimes I am able to take another look and powerlines become a strong compositional element. That was the case with this photo. I probably shot 20 photos walking home and sometime on that walk I discovered this composition. Part of it is being able to really see what's in front of you and be open to it and work with it instead of fighting it. If there are powerlines all over in a scene you want to shoot, try to find a way to let them be a part of the photo's meaning. Long, compressed shots work well for this, I think. John - just a question...........in your travels have you gotten any of the "red dots/spots" when shooting especially when the sun is not in back of you - or if the sun is in or near the frame? I've had some red dots when I was shooting with the sun in the frame - not shooting directly into the sun, but close. Doesn't sound familiar, Liz. Can you post an example? Here goes: It's pretty ugly. I googled E-PL2 red dots/spots and came up with quite a few blogs, photo websites, etc. where people are talking about it. Most people from what I read think it is just flare. And some people have posted images with red dots from other cameras in similar situations. It is supposed to happen when you shoot directly into the sun - as my images show, it happens also when the sun is somewhere in the frame even when you don't shoot directly into the sun. I called OlympusUSA. Their customer service was honest. The person I spoke to said he hadn't heard of it, but asked his supervisor. His supervisor said they are just becoming aware of it and are looking into it. I almost sent the E-PL2 back, but decided I don't take enough photos with the sun in the frame to worry about it much - and I just love this camera. BTW - this can happen also if it is evening/night and there is a bright street light or other light you're shooting near - typical flare areas. Thanks Greg - looks like Kirk Tuck isn't making a big deal out of it. Although it is mentioned there also that Olympus says they are looking into to it now. Interesting note: I just saw some images from the new Oly XZ1 - seems this camera is exibiting the same phenomenon. I'll see if I can find the images again - and post the link. It would be interesting to me if an ND or polarizing filter would cure the problem? I really think as long as you know it you can deal with it. I agree. Actually when I called Olympus CS that was one suggestion - get an ND filter. The other is to change the settings when I see this type of thing on the LCD or VF which makes sense. There are some blogs, and a few other places where people are expressing their upsetment with Olympus as the general thought is that it is a hardware problem, having something to do with either the sensor or the IR. I'm too technically challenged to figure that one out! However, I don't make it a habit to shoot into the sun or close to street lights at night. Although I do think Olympus should say something since they told me they are looking into it. I thought I'd post a couple that look good - straight out of camera - taken at the same place about 20 minutes earlier. Wow that last shot is awesome. Maybe it has something to do with the thinner AA filter? But I haven't read any complaints with the E5. But it may have a different sensor too. Both the E-PL1 and E-PL2 have wonderful - and great fun - art filters. One of my favorites is the b+w or sepia and/or grainy b+w. Forgot which form of b+w filter they offer. However, it is a lot of fun using them. Thanks, guys! I have not seen those spots. But I very rarely shoot right into the sun. When I saw your photo, Liz, I was trying to thing of what in the lens might produce such a pattern. My guess is that it's a reflection off the sensor back into the lens and then back into the sensor. That's the only thing I can think of that might make a pattern like that. But I don't really know. I guess it's worth repeating what Kirk Tuck said in his review: "Don't shoot directly into the sun or strong lights." And you know the old joke - Guy goes to see the doctor and says,, "Doc, when I do this it hurts." Doc says, "Don't do that." Thanks John. I always appreciate your input.